In this work, nickel nanoparticles (NiNPs) and graphene oxide (GO) were synthesized and characterized independently using spectroscopic and microscopic characterization techniques. Then, a new glassy carbon electrode modified with electrochemically reduced graphene oxide decorated with nickel nanoparticles (NiNPs/ERGO/GCE) was constructed by electrodeposition. The novel platform, NiNPs/ERGO/GCE, was characterized using scanning electron microscopy (SEM) and cyclic voltammetry (CV). SEM analysis clearly revealed efficient incorporation of NiNPs into the graphene sheets on the surface of the electrode. The prepared platform was used for the determination of diclofenac (DIC). 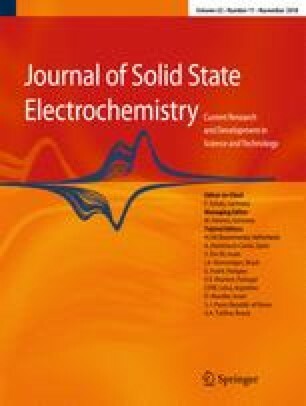 A significant enhancement in the peak current response for DIC was observed at the composite modified electrode compared to the unmodified electrode. The NiNPs/ERGO composite modified electrode demonstrated excellent square wave voltammetric response towards the determination of DIC in the working range of 0.250–125 μM. The limit of detection (LOD) and limit of quantification (LOQ) of the proposed method were found to be 0.09 and 0.30 μM, respectively. The sensor was validated successfully for real sample analysis in pharmaceutical formulation and human urine samples with good recovery results. The proposed sensor also displayed good repeatability, reproducibility, long-term stability, and selectivity towards potential interferents. Hence, it is a promising material for electrochemical sensing of diclofenac and other similar drugs and biologically active compounds in real samples. The online version of this article ( https://doi.org/10.1007/s10008-018-4071-3) contains supplementary material, which is available to authorized users. The authors gratefully acknowledge the University of the Western Cape, Department of Chemistry, for supporting this work.